Gluck was born in Bavaria and died in Vienna. Of the many operas he wrote, only Orpheus and Eurydice remains in the standard repertoire. The story, of course, is Greek, and had been set to music many times before Gluck addressed it, and many times since. Several Renaissance composers used the story to restore the Greek sense of tragedy. The Greek story, as a source for opera, has a long history. The first known performance of Peri's version was in Florence in 1600. The great Claudio Monteverdi, sometimes described as the "inventor" of opera, produced his version, Orfeo, in 1607, in which he introduced the duet (operas had been made up of alternating solos), and he increased the size of the orchestra to a whopping thirty-eight! A hundred years later, Gluck took up the challenge. He was disgusted by the excesses of the singers of the past, who were encouraged to embellish the melodies and did so without regard to the meaning of the text. He insisted on a straightforward approach, and he even banished the standard harpsichord accompaniment in order to emphasize the orchestra. The only concession to public taste, and an insult to the tradition of Greek tragedy, was his happy ending. Only knowing of this unexpected ending will the overture seem appropriate. In more recent operas the overture consists of a medley of themes we are yet to hear during the opera proper. However, "overture" really means "opening," and, previously, it was a short piece intended only to set the mood of the story without announcing any of the themes to come. Since the plot is about the death of Eurydice and the mourning of her lover, Orpheus, the overture seems surprisingly jaunty. The opera begins in a tomb in the underworld, where Eurydice lies on a bier. Orpheus is so distraught by her death that Amore, god of love, takes pity on him and suggests that he journey to the underworld to lead Eurydice out. There is, however, a catch to the escape plan, typical of Greek drama; Orpheus is not to look at her until they are safely above ground. She thinks his unwillingness to look at her implies that he no longer loves her and she lags behind until he takes a glance back, and she falls dead. Orpheus is even more remorseful, since he is responsible for her second death. As the result of his lamentations, Amore takes pity on him once more, and restores Eurydice to life, perhaps justifying the somewhat light-hearted overture. The Symphony No. 94 is one of twelve symphonies Haydn wrote for the violinist and impresario Salomon during his first visit to London. These twelve symphonies are known as the "Salomon" or "London" symphonies, and are considered by many to be his best. It is subtitled "Surprise" for debatable reasons. It is the sudden fortissimo in the second movement (Andante) that gives it the nickname, and tradition has it that Haydn was trying to wake up the audience in that otherwise sedate moment. When asked directly if that was his intention, he said not really, but he was trying to surprise them with something different and he wanted to outdo his student, Pleyel, who had also debuted one of his own works a week earlier. The work is in four movements, something common to Haydn, but not often found in the symphonies of his predecessors. In fact, Haydn established the tradition of four movements for a symphony, followed by most of his successors. It has an introduction which wanders about with scant regard to key relationships and even the opening of the first movement after the introduction surprises us with its key shift. The manner in which he uses themes, some derivative of one another and some original, confound thematic analysis, and surprise us at every turn. Although there are certainly surprises in the first movement, it is in the second movement that we are elbowed by that famous fortissimo. Some describe the movement as "weak," having a theme so simple that the variations seem pretentious, unless you consider Haydn to have had a sense of humor. Other critics think the theme is great enough to make the listener think it has been heard many times before, whether or not it has been. Haydn obviously liked it enough to use it again in his oratorio The Seasons. The third movement, a minuet, is imbued with folk-tunes, a device frequently used by Haydn. There is a comic irony here, in that the Ländler peasant informality might be contrasted with the formal dignity of the original minuet as a dance. The final movement is basically in the conventional rondo form, where a main theme alternates several times with other short themes. It brings the symphony to a rousing end. Samuel Barber was of the same generation that produced Aaron Copland, Virgil Thompson, Elliot Carter, Roger Sessions, and Walter Piston, but he was unlike any of them. He has been described as America's last Romantic. In that respect, he resembles Rodrigo as Spain's last Romantic. Barber never subscribed to any of the contemporary musical trends (or fads, of you will). He was his own man, and suffered from critics of both sides of the critical spectrum. At a time when American composers were expected either to embrace the experiments of the New Viennese School (that is, the dodecaphonic and serial techniques of Schoenberg, Berg, and Webern) or to throw themselves into the rush to prove themselves American through the use of folk music of various kinds (Copland, Thompson), Barber took neither route. He wrote as he pleased without regard to fashion. He was inspired by literature, mostly European and often Classical. This is obvious in his vocal music, but it is also apparent in his orchestra works (Medea, Overture to The School for Scandal, Essays for Orchestra, Music for a Scene from Shelley). If the name Barber is not familiar to you, that is a pity, because he was one of America's most distinguished composers. What's more, you have all heard and admired at least some of his music. In 1936, as the result of two awards, Barber went to Rome where he composed at the American Academy. There were two important products of that visit: Music for a Scene from Shelley and the String Quartet, Op. 11. Barber re-orchestrated part of the second movement into what is now known as the Adagio for Strings. It has served as elegiac background music to many films, most notably Platoon, but also in an impromptu performance over the BBC immediately following the attack on the World Trade Center. It is an extremely moving work, and is known worldwide. Barber was born into a well-to-do family in West Chester, Pennsylvania, not far from Philadelphia. In the words of biographer Paul Witke, "He was spared the virtues of poverty and never enjoyed the values of starving in a garret." He began piano lessons when he was six and wrote his first opera when he was seven. He was strongly influenced by his aunt, who was an opera singer with the Metropolitan Opera, and his uncle, who was a writer of art songs. Although Barber is well-known for his orchestral pieces, he was drawn mostly to vocal music. He had a strong baritone voice which stood him in good stead as he promoted his opera Vanessa to the Director of the Metropolitan Opera, and, on the basis of his music and his performance of it, was granted a contract for the production of that opera. Samuel Barber was, in many ways, a solitary man. He refused to talk about his music, even to his closest friends. On the other hand, he was an urbane, cultivated, internationally minded, witty conversationalist, very much like Cole Porter, and, like Porter, he wanted his music to be accessible to the masses. Although nobody would describe Barber's music as "popular" in the sense that Cole Porter's was popular, his music was much more accessible than much other music of the period. Writer Wilfred Mellers, a specialist in American music, believed that Barber was strongly influenced by a desire to relive his childhood. So was James Agee, whose work inspired Knoxville: Summer of 1915. This short work was a prologue to Agee's autobiographical book, A Death in the Family. Agee wrote, "We are talking now of summer evenings in Knoxville, Tennessee, in that time that I lived there so successfully disguised myself as a child." The work was commissioned by the world-class opera singer, Eleanor Steber. Barber conceived the piece as if sung by a child. We can imagine the soloist representing the childhood memory of a man, longing for a time of lost innocence. The poetry speaks of calm beauty, but the dissonance expressed by the orchestra suggests the contrast between the tranquil security of a child in a loving family with the unknown terrors of the "ignorant armies." (This was 1915, don't forget!) After that orchestral outburst, the music returns to a lullaby as the child is put safely to bed. Edward Kennedy "Duke" Ellington is a colossus among American composers and band leaders. With a career spanning more than fifty years, he wrote over one thousand compositions, many of which have become jazz standards as well as precious, irreplaceable gems of the American Songbook. Though not ostentatious about his religious beliefs, Ellington's faith ran deep, and by the early sixties he was commissioned to composer "A Concert of Sacred Music" as the centerpiece for the consecration of San Francisco's Grace Cathedral in 1965. During the period from 1965 to 1973, he would write a total of three sacred concerts. Although lesser known works, to Ellington they were "the most important thing I have ever done." When asked why it took so long to write the sacred concerts, he said, "You can jive with secular music, but you can't jive with the Almighty." Almighty God Has Those Angels was written for Ellington's Second Sacred Concert that made its world premiere in New York City at the Cathedral of St. John the Divine in 1968. Oddly, no recordings have surfaced of this live event, but it was recorded in studio later that winter and released as a double LP. Critics hailed the new work as being fresh and adventurous, noting Ellington's use of "novel techniques and sounds beyond his usual big band spectrum." There was also high praise for Swedish soprano Alice Babs, calling her "virtuosic" and "a worthy successor" to Ellington's earlier vocalists, such as Mahalia Jackson. Ellington's original arrangement of Almighty God Has Those Angels is deliciously complex. He has the bass and drums simultaneously evoke a fast jazz waltz feel, while the vocal melody and piano harmony express a slower shuffle rhythm. Written especially for soprano Danielle Talamantes, Henry Dehlinger's orchestrated arrangement preserves and blends these two elements, while providing a rich musical platform over which Talamantes' voice can soar. She sings as an improvising instrumentalist might play then eases back into the melody. A mixed chorus and orchestra join in for the climactic final chorus. As Steven Ritter says in his September, 2016, Audiophile Audition review of Talamantes' recorded performance of Dehlinger's arrangement, "these are well-executed, highly stylized renderings tinged with Ellington's trademark harmonies and inventive melodies, sung with virtuoso perfection by one of our up-and-coming stars." Orchestrated by the composer in 2016 for the Manchester Symphony Orchestra, Henry Dehlinger's The Mount for Soprano Solo and Orchestra makes its world premiere this evening under the direction of Maestro Scott Humphries. Written especially for rising opera star Danielle Talamantes, The Mount was originally commissioned by The Casement Fund of New York through its Triad Grant, which is awarded each year to three artists -- a vocalist, who in turn selects a composer and lyricist. With text by conductor, choral musician, and poet Mark Riddles, The Mount is based on Riddles' collection of sacred poems in which he recasts famous biblical passages in remarkable sensory language. Originally conceived and written as an art song for soprano solo and piano, The Mount received a resounding ovation at its New York City world premiere performance on November 15, 2015, in Manhattan's historic Episcopal Church of the Holy Trinity. The Mount's Elegant melodic line and use of Phrygian dominant scales evoke the powerful chantes of Jewish liturgical music. At The Mount's climactic summit midway through the piece, Talamantes soars above the orchestra then shifts to a lyric pianissimo as the sings Riddles' beautiful verse. The harp also plays a prominent role which with Talamantes' gorgeous lyric soprano voice, Dehlinger's lush string scoring, and legato woodwind arpeggios lend an empyrean quality to the work. "It's not often that a fortunate operagoer witnesses the birth of a star!" critics hailed for Denielle Talamantes' recent role début as Villetta in La Traviata. 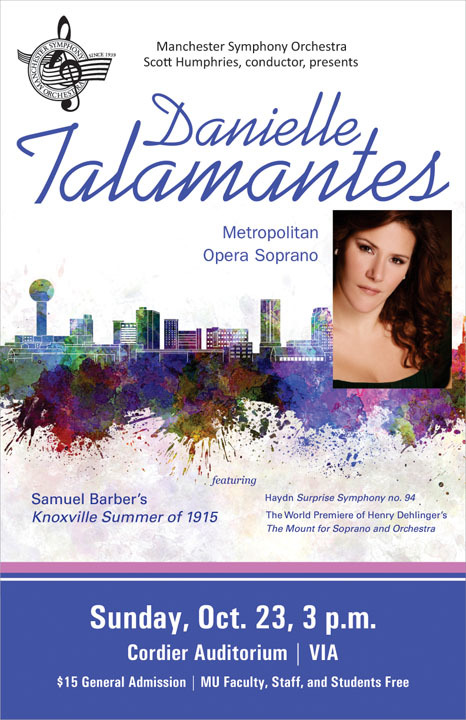 This season, Talamantes performs the role of Anna in Nabucco and Frasquita in Carmen with The Metropolitan Opera, and sings the soprano solo in Handel's Messiah and Brahms' Requiem with the Phoenix Symphony Orchestra, Verdi's Requiem with Gloria Musicae, and Barber's Knoxville: Summer of 1915 with the Manchester Symphony Orchestra. Additionally, she will be featured soprano soloist with the Northwest Back Festival in Spokane and also the Philadelphia Chamber Music Society. Ms. Talamantes and Henry Dehlinger perform Heaven and Earth: A Duke Ellington Songbook, a luscious collection of brand-new arrangements of Duke Ellington standards and irreplaceable gems of the American Songbook -- written especially for Ms. Talamantes, in recital at multiple venues across the country. They also perform, in recital, a concert of gorgeous Spanish songs featured in their critically-acclaimed MSR Classics album Canciones Españolas. Talamantes and Dehlinger captivate audiences with tales of amorous longing, joy, and despair as they bring the lush music and poetry of Spain to life. Last season, Talamantes sang the soprano solo in Haydn's Creation with the Cathedral Choral Society; Handel's Messiah at the Phoenix Symphony and National Philharmonic; Haydn's Lord Nelson Mass at the National Philharmonic; Haydn's Gloria Musicae with Gloria Musicae in Sarasota; Vaughan Williams' Dona Nobis Pacem at the Fairfax Choral Society; a Bach and Handel concert with Choralis; Carmina Burana at New Dominion Chorale; Adina in L'elisir d'amore at Gulf Shore Opera; Mimi in La Bohème at St. Petersburg Opera; and Violetta in La Traviata at Finger Lakes Opera. Danielle first earned a spot on the Metropolitan Opera roster in the spring of 2011, covering the role of Najade in Ariadne auf Maxos, and was subsequently reengaged for roles in Wagner's Parsifal, the Baroque pastiche The Enchanted Island, and in Strauss' Die Frau ohne Schatten. This rising star made her exciting stage debut as Frasquita in Bizet's Carmen in a 2015 return to The Metropolitan Opera. Other recent engagements include a return to the National Philharmonic for both Beethoven's Symphony No. 9 and Mozart's Requiem and Exsultate Jubilate, which she also performed with the City Choir of Washinigton; as the soprano soloist in Bob Chilcott's Requiem at Alice Tully Hall; the soprano lead in a world premiere production of Janice Hamer's Lost Childhood with the National Philharmonic in Washington D.C.; Mozart's Mass in C Minor with the City Choir of Washington; a turn as Donna Anna in Don Giovanni at Cedar Rapids Opera; Dvorak's Stabat Mater at North Carolina Master Chorale; and a debut at Spoleto Festival USA as Sergente in Veremonda.